GTK has added of E-Paper technology to its display product range. 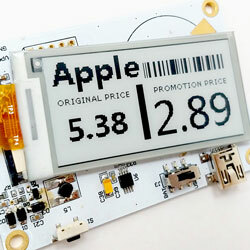 The technology offers a low-cost, flexible display with broad viewing angles and good sunlight readability. Its standout feature is that it retains the image on the screen without using power, making it excellent for a broad range of consumer electronic applications. The range is offered in three sizes: 1.54”, 2.13” and 2.9” graphic modules. These modules show black text or images on a white background and have an operating temperature range of 0-50C. Clive Dickinson, business manager for displays at GTK, stated, “E-Paper technology has been around for longer than most people think. The first iteration of this technology was created in the 1970s, but it’s only in the last decade that people have been aware of it, as it started being used in consumer products such as e-readers, mobile phones, retail price labels and digital signage. The company has a wide range of display technologies, and its technical experts can assist OEM customers with display selection and design, and interconnect options to connect the display to the PCB.